Synergy Software Design is the leading provider of custom software solutions for the U.S. Navy, specializing in documentation and analysis of as-built assets. Through 3D visualization and documentation of naval infrastructure, they have assisted in strategic decision-making and saved the Navy billions of dollars on various projects. Upon hearing of the DPI-7 Kit, Synergy Software immediately saw the value of putting 3D capture directly into the hands of their team on-site. Much of their work for the Navy has revolved around pier infrastructure documentation and coordination, but until the DPI-7 they were forced to document by hand under constrained timeframes in security controlled areas. With Synergy Software’s implementation of the DPI-8 Kit, they now found that they could produce a full 3D model on-site in one visit, capturing more detail than ever before with limited access to the site. In April 2014, Synergy Software was contracted to document naval submarine pier infrastructure in Washington State. All doors, hookups, hoses, and other connections needed to be documented into a near 100% confidence model. With limited access to this heavily protected site, the SSD team knew this was a project for the DPI-8 Kit. In a single visit to the secure site, the Synergy Software team was able to walk up and down the pier with their DPI-8 Kit, collecting several scans of the facility. 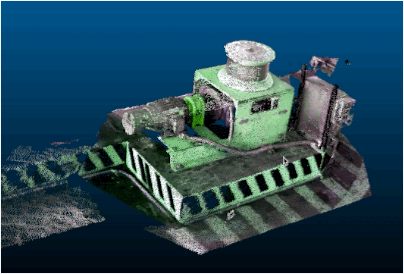 As seen in the image above right, the DotProduct scans produced an impressive amount of detail on the specific equipment systems for each interval of the pier, all in fully measurable, color 3D. no issues with the data captured and all parties were impressed with the technology. Mooring hardware captured with the DPI-7 Kit. With this type of infrastructure documentation, it is very possible for different connections, ports, etc. to be misaligned or overlooked entirely - a mistake that can prove catastrophic when dealing with crucial submarine logistics. By utilizing the DPI-8 Kit on-site, Synergy Software Design ensured that all details were captured in a single comprehensive scan session. With the convenience and mobility of the DPI-8 Kit, the team at Synergy Software are making an excellent case for the power of handheld 3D for as-built documentation and management of both military facilities and industrial complexes. Synergy Software Design, LLC is a small business, HUBZone-certified Federal government contractor established in 2004. They offer Software Development, Consulting, and CAD services to our Federal government and commercial clients. They are experts in the fields of facility asset management, inspection data systems, training and simulation tools, data and application requirements consulting, and healthcare IT systems.